Border patrol agents unknowingly provided security at a wedding for a convicted drug smuggler. 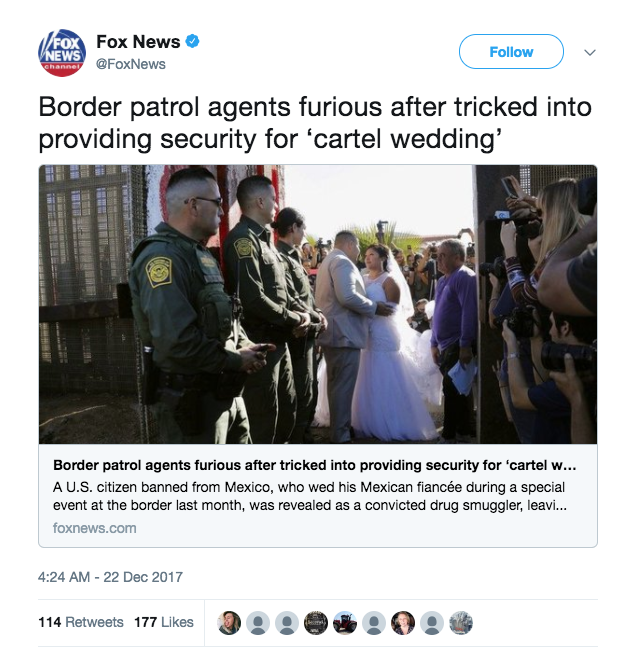 Border patrol agents were angry to find out that during a special event at the U.S.-Mexico border last month, they provided armed security for a “cartel wedding,” the San Diego Tribune recently reported. After a background check, Brian Houston was cleared to participate in the “Door of Hope” event at Border Field State Park, which allowed him to marry his Mexican fiancee. The wedding ceremony was requested because Houston said he could not cross into Tijuana. The wedding ceremony was the first of its kind during the event, where the park opens its gates for an hour once at least once a year. The event allows people who are not allowed to cross the border to meet with each other for three minutes. But Houston is not allowed to enter Tijuana because he is awaiting sentencing in San Diego federal court for being a convicted drug smuggler. In February Houston was caught smuggling 43 pounds of heroin, 47 pounds of methamphetamine and 43 pounds of cocaine, according to the complaint, the San Diego Tribune reported. Houston pleaded guilty to charges of importing controlled substances in May. He is to be sentenced on Feb. 23, 2018, the San Diego Tribune reported. Border Patrol Spokesperson Takae Michael told the San Diego Tribune that Houston was “screened through an internal vetting process based on biographical information provided to us” by Border Angels nonprofit group’s Enrique Morones, the executive director or the group that organizes the event. “A review of the provided information, through our DHS [Department of Homeland Security] systems, did not indicate criminal activity,” Michael said. “Border Angels has never done any background checks, as the Border Patrol advised us they will do all background checks and advise us which families have been cleared,” Morones said in a statement to the San Diego Tribune. “We were shocked to learn this past week of Brian Houston’s very serious criminal situation. That goes against everything Border Angels stands for,” Morones added. The future for “Door of Hope” events is now uncertain due to the incident.